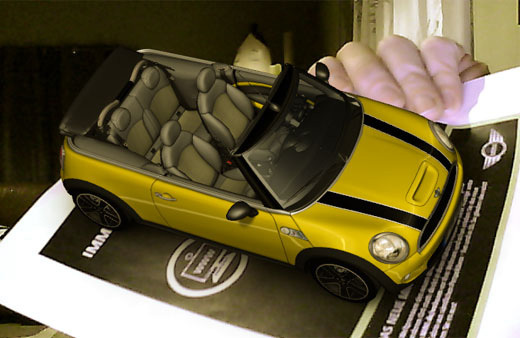 Mini has released a print ad in Germany that takes advantage of augmented reality technology to give you a virtual model of the new Mini convertable. When you go to the special Mini website you can launch an applet that ties into your webcam and looks for the print ad. Hold the ad up and you get a 3D model of the car. Unfortunately, the application is Windows/IE only right now, but if you’re on a Windows machine you can print out a PDF of the ad and try it out yourself. Check out the Technabob post for more information and a video. 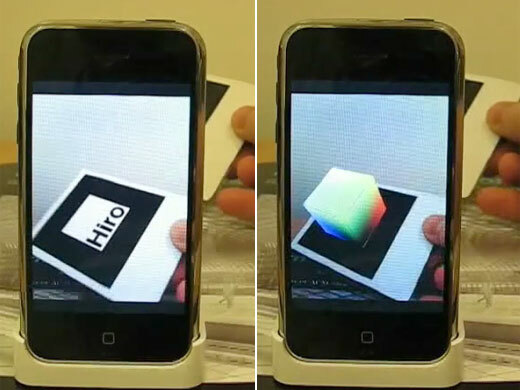 My friend Henry also pointed me to this article on artoolkit for the iPhone, which gives developers the ability to roll out this sort of interactive media on the handheld. It would be amazing if applied to print ads in the city, with 3D models and even video trailers for movies being overlayed. Nearby WiFi access points could be installed or leased to provide bandwidth (perhaps the AR application used could automatically connect to WiFi hotspots with certain names).